Executive Director of Youth for Human Rights Mexico, Ernesto Hurtado Ruiz, trains educators to deliver human rights education. Mexican youth are feeling the impact of the country’s social problems in the form of bullying. Today, bullying has reached alarming proportions at all levels of the Mexican educational system. High school bullying statistics, specifically, are rising in this nation, where it’s reported that six out of ten students are victims of school violence. Children with disabilities or some type of physical problem are especially susceptible to discrimination and bullying. Youth for Human Rights (YHR) Mexico is working to eradicate this behavior by raising awareness and carrying the message of universal human rights to parents, teachers, principals and schools throughout the republic. To that end, an agreement was signed between Martha Valdes Cabello, Director of Special Education for Mexico’s Ministry of Education, and Youth for Human Rights Mexico. With the agreement in place, YHR began by delivering eight seminars to school supervisors—a total of 700 individuals who learned how to raise human rights awareness using the lessons and materials of the program. These supervisors in turn represent 3,500 teachers across the country in 3,007 basic education schools. In addition, YHR Mexico trained 380 social workers in human rights under the auspices of the Mexico City’s Ministry of Education. All training has one aim: to arm educators at all levels to teach the youth of Mexico how to defend their rights and respect the rights of others. To achieve this in the schools, the supervisors who trained are training their teachers at the primary and secondary school levels, and those teachers are in turn delivering the program to their students. Educators were inspired by the quality of the materials and the presentation. “Today I was one of the directors who received training to promote human rights. Thanks for the information shared, the well-made tools, and the materials provided, but especially for the hope and motivation that they gave us. I signed my promise and I join the efforts to promote, defend and preserve human rights in my school, family and community.” One principal told the YHR Mexico Executive Director Ernesto Hurtado Ruiz that for months she had been thinking about how to handle the problem of bullying. She said the lecture she attended in the YHR training was her “Eureka!” moment—when she realized that she had found the solution. 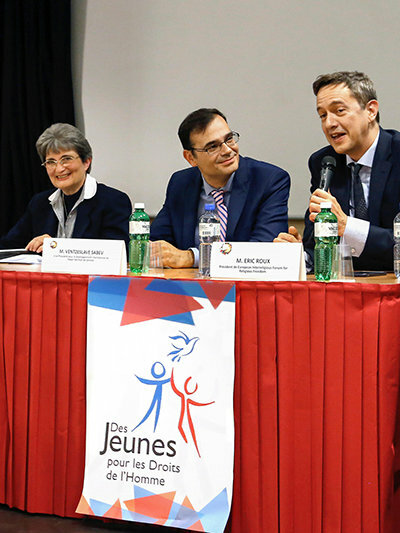 Human rights panels, such as this one in Geneva, Switzerland, raise awareness. This year United for Human Rights and Youth for Human Rights International chapters across the globe are celebrating the 70th Anniversary of the Universal Declaration of Human Rights (UDHR), issued by the United Nations in 1948. 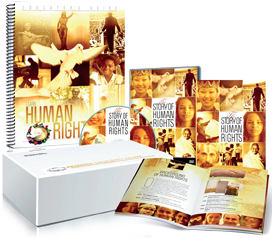 As the pre-eminent document clearly setting forth the 30 inalienable human rights we all have, the UDHR is a guide for all nations in educating citizens on what their rights are, so they can respect, protect and maintain them for themselves and others. Throughout this year, we’ll enlighten millions more through our events, audio/visual resources, petition-signing activities, seminars, panels, art contests and TV programs. 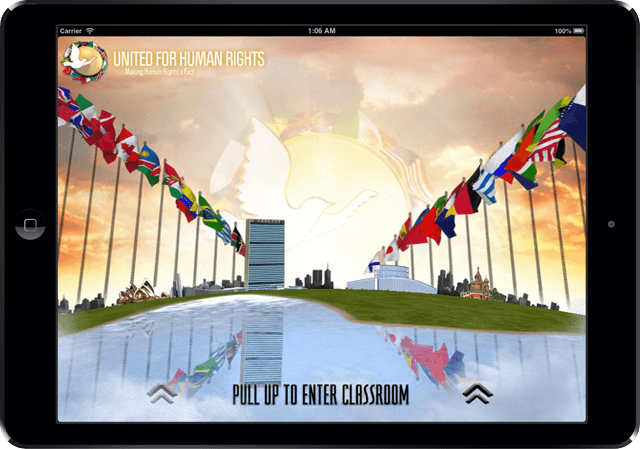 This is the perfect time to start your own chapter of Youth for Human Rights or United for Human Rights. With our materials, you can help forward this initiative for equality, tolerance, respect and peace. Contact us and let us know your plans.